Nicole Thompson, Lower School Director, guest blogs about her travel to China with Jenny Murray where the familiarity of the Yungu School felt like home. 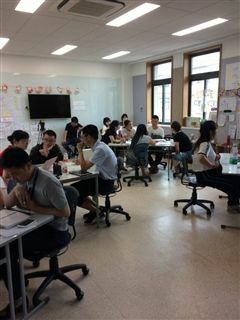 At the beginning of July, I had the privilege of traveling to Hangzhou, China with Jenny Murray, Middle School Director, to host a Duke School Project training at Yungu School. Yungu School has just completed it’s first year in existence with first and seventh graders and will continue to add a grade each year over the coming years. Yungu School was founded by Jack Ma, a Chinese businessman, investor, and philanthropist. He is the co-founder and executive chairman of the Alibaba Group. Alibaba is an e-commerence firm – imagine Amazon on steroids. The goal of the school and Mr. Ma is to educate employee children and local students within a progressive framework. In 2020, the school will open a brand new campus to host its program that will then extend into high school. To say their plans are bold is an understatement. During his travels to China in April, Dave, Head of School, talked with many different schools and their leadership teams including those at Yungu School. With one year of project work under their belt, they were looking for guidance on deeper work with project. Through multiple conversations and planning sessions we were able to set a plan for training with their staff. Jenny and I set off to Hangzhou with a four-day training schedule in hand along with a great deal of excitement and many questions of our own! As Jenny and I entered campus, there was a certain familiarity. Art projects and hands-on work were all over the hallway walls. 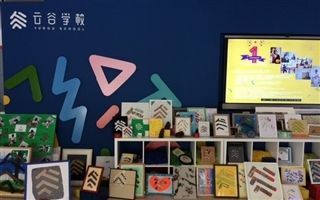 The bulletin board at the entrance featured the students’ "hopes and dreams" for the year and there were several dozen student representations of their school logo. As we toured classrooms, we saw spaces with carpeted areas for group work, shared tables for collaboration and quiet individual work spots. The warmth of their work was felt in all areas of the school. In short – it felt like home – like Duke School. We are fully committed to nurturing our students to grow into happy global citizens and lifelong learners who are charitable and independent, with a strong sense of social responsibility. reflects so many of the ideals that we have at Duke School. These shared beliefs made our visit to Yungu feel like a journey home. *Review the beginning of Duke School's China explorations with Dave's "A Promising Future" blog.